I frequently visit many cooking sites and every month, I notice that many blogs, started to post the same recipes, at certain times of the month. I was pretty surprised, so I decided to find out what was going on. I soon learned that many of the blogs that I viewed, were all a part of a group called The Daring Kitchen. I was intrigued. Daring Kitchen is a group started in November, 2006 when two ladies decided to challenge themselves to make a recipe, using the same recipe. They decided to try making pretzels and to post their results on the same day. They loved doing this so much, that they continued doing this every month, with other bloggers joining in. So began The Daring Kitchen. Every month, on a certain release date, a recipe, with all the techniques and how-to’s are released. Members have 1 month to prepare the challenge (and it is a secret challenge) and on a certain day, those who participate will post their results on their blogs. I loved the idea of learning new techniques and making myself a better cook, so in January, I signed up. I had to wait until January 17th to get my first challenge! I could hardly wait! Hiyashi Soba is a popular dish in summer. It’s like a noodle salad. Restaurants in Japan serve Hiyashi Soba only in summer. Even if you don’t have much appetite because of the heat, Hiyashi Soba can be appetizing. Common Hiyashi Soba toppings are omelet strips, ham, cucumber and grated Diakon. You can also have the noodles just with the dipping sauce. Tempura is a Japanese dish of seafood or vegetables that have been battered and deep-fried. Yea! Cold summer food, in the dead of winter! That’s alright, the host for this month’s challenge lives in a warm climate and suffered making a winter stew, in the middle of her summer. That said, this was an awesome dish and I am so glad that joined in time to make it. Lisa from Blueberry Girl did an excellent job writing the recipes and giving suggestions. We definitely plan to have this again (in the summer). The challenges I face with this dish was obtaining the ingredients and organizing all the ingredients, so that all the various dishes could be on the table, as fresh as possible. Frying all that tempura was a challenge but thanks to my husband’s help, we were able to fry everything nicely. Another problem was my thermometer did not go to 340F but thankfully, the recipe gave a good method to test the oil’s readiness. For the Soba Noodle Toppings, I served Japanese Thin Omelet, ham, chicken breast (I boiled with bonito broth), English Cucumber, Nori and Scallions. For Tempura, I served Sweet Potato, Broccoli, Mushrooms and Shrimp. I prepared both the traditional sweet dipping sauce and the spicy dipping sauce. So on with the pictures of the food! Cutting slits in shrimp allows shrimp to remain straight when fried. Soba noodles, rinsed before resting in ice water. My Husband’s bowl, ready to eat! My bowl, ready to eat! Wow so many photos. Looks superb! Thank you so much 🙂 It was difficult to take pictures while cooking, but my husband was a huge help! 🙂 Thank you for visiting! oh wow, you did a great job! Thank you! I am so happy my first challenge turned out well! I am still craving those sushi tempura you made! Thank you for visiting! I can’t wait for the next challenge! Happy Cooking! WOW! this dish must have taken lotsa time and effort on your part! You should be proud of yourself to follow this recipe through and through! Thank you 🙂 I really enjoyed making this dish. What a feast. Welcome to the DC and congrats on your first challenge. Thank you so much! I am so glad I joined! Wow, this is such a wonderful feast that I won’t be afraid to try. Oh I forgot to tell you, I made the pork and it was delicious girl. Thanks for the recipe :). And Happy Valentine’s day to you and your husband :). Same to you!! Happy Valentine’s Day and may it be filled with love and chocolate! *HUGS* And I am glad you liked the pork recipe!! Welcome to the Daring Cooks and congratulations on completing your first challenge! You did a great job finding all the ingredients and photographing all the steps. Glad you enjoyed it! Thank you so much! I really enjoyed the challenge! I can’t wait for the next one! 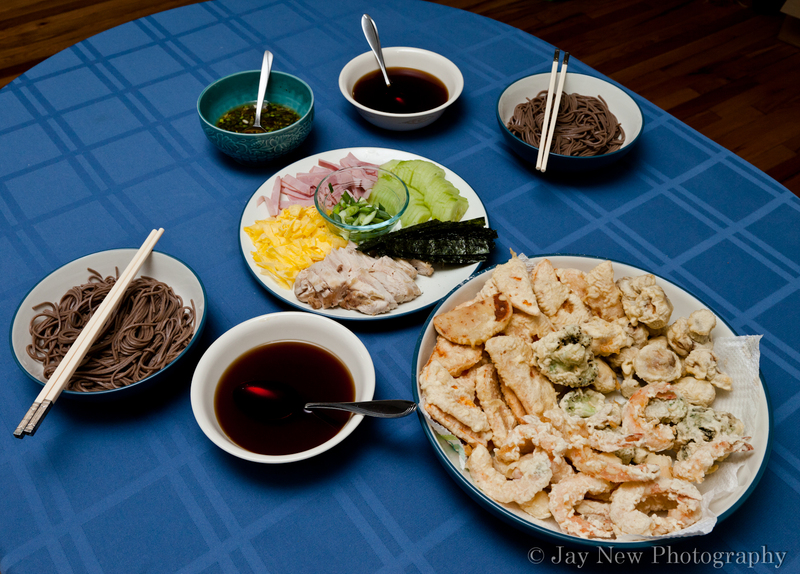 Your soba and tempura look great! Welcome!! That sounds fun, I guess I will try to join soon! This was definitly fun! I hope you enjoy it! Your wife may enjoy the Daring Bakers group. They do beautiful recipes! Welcome and hello to the Daring Cooks’ and congratulations on your first very successful challenge. I love all the pictures well done and the final version looks so delicious. Thank you so much! I really enjoyed my first challenge. Not only was it fun to find all the ingredients but the dish was fun to make and tasted wonderful. This will definitely be made in our house, again and again!